I don’t have a single room that I use as a studio, but I do have a couple key areas! The bulk of my work happens at my computer. It’s in what we call the dining room nook. At some point in time in our house’s existence (I think pretty early on, since all the walls are still lath and plaster) someone enclosed the side of the front porch that was adjacent to the dining room. It’s the perfect spot for my computer desk. There’s plenty of natural light (tons of windows). We used to have a daybed in here, but have moved that into the spare/guest bedroom. The desk was my maternal grandma’s. I found the Eames Aluminum Management Chair on Craigslist (sheepskin is from Ikea). I use a MacBook Retina Pro running Bootcamp and Windows 7, and have a large screen that’s hooked up to it. I also have a garage sale table that I painted turquoise, and an Ikea RÅSKOG Cart, in the same area. I keep ink bottles in the drawer in the table. Yarn for designing is in the cart. I also have a large cabinet with drawers that we found at a garage sale. This is against the wall in the dining room across from the dining nook. It contains all sorts of things — yarns for designing, swatches, color samples, knitting needles and other tools, and more. Finally, here’s where I do most of my knitting! On the couch, in that corner. The big window behind the couch gives a view of our front yard. There’s also two side windows, not shown, on the other wall perpendicular to that wall. It’s also a very bright sunny room. Not pictured: the Craigslist bookcase in which I store all my knitting books and a bit of personal yarn. As I was writing the post title I realize how impossible it would be to describe a day and say that was representative of every day. And certainly, even if I could come up with a typical day for me, it doesn’t mean it’s typical for any other designer! Since I also work as a locum tenens (filling in at clinics as needed) small animal veterinarian, part time to full time, my work schedule changes from week to week. Often I work half days at a local feline practice, and I’m usually home before 2p; sometimes I work a vaccine clinic on Wednesday nights, which consumes the time between 5:20 and 8 or 8:30p; other times I’ll do full days, which can mean I’m gone from home from about 7 or 8a to 6:30 or 7p. I also often work Saturdays. Designing fits in before, after and around those times. If I’m don’t have a vet job that day, I usually work at the computer in the mornings, and (ideally) knit in the afternoons and/or evening. The occasional photo shoot is in the afternoon as well. Computer time includes tech editing, website maintenance, social media, pattern layout, creating or editing charts, creating schematics, design planning, submissions, accounting, pattern support, self education (I really need to improve my Photoshop skills! ), etc. There is ALWAYS something that can be done: uploading patterns to other sites than Ravelry, planning tutorials or blog posts, and so on. 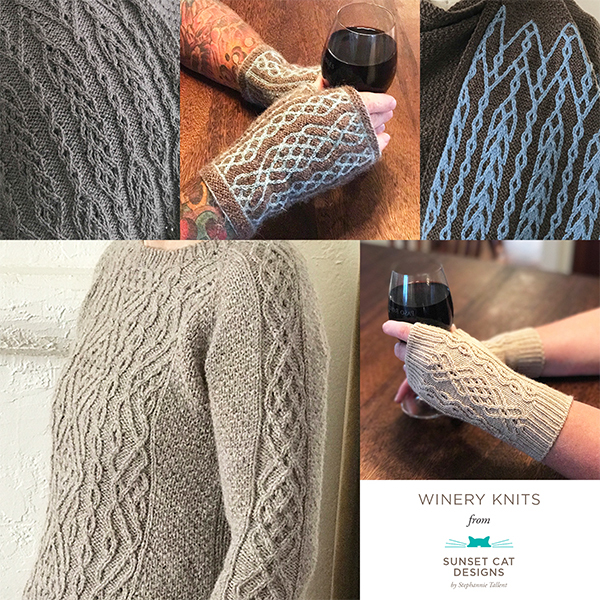 I wrote a whole post here on learning to develop my own website — not necessarily a skill you’d think you’d need as a knitting pattern designer! Usually, though not ideally, those tasks spill over into the afternoon. Knitting is just that: swatching or working on a pattern in progress. I’ll knit or swatch in the evening as well. If I’m on a deadline, I’ll try to do more knitting, but if I knit more than a certain length of time (several hours) I’ll get to a point where my hands (especially my left) start aching and I need to stop. We’ve all been there! If I’m working a full day at a vet clinic, I’ll work on computer stuff at lunch, and hope to knit in the evening when I get home. If it’s just a half day, I hope to catch up on computer stuff and knit once I’m home. I’ll do quick tasks before heading off to work (if I start something involved, I tend to lose track of time!). This is the first in series of things you end up finding out you need to learn about as an Indie Designer! If you’re just starting out designing, read this post first. I’ve gone through and tagged posts I think are of interest to indie designers (beginning and otherwise); click on the category Designer Tools to see more. Even if you don’t want to blog, IMHO you do need a website. If you’re reading this, you’re used to going to the Internet for information. So are most other folks, especially those who are your customers (assuming you’re selling patterns, um, ONLINE). I just got a button machine! In addition to making my own custom buttons (my logo, cute sayings, kitteh pictures) I’m able to make custom buttons for other indie designers and indie yarn companies. Interested? check out the Buttons Page.